Heavy rain, powerful winds and severe thunderstorms are expected to barrel through the Chicago area Tuesday as a massive winter storm makes its way across the Midwest. Just after 1 p.m., the National Weather Service issued a special weather statement for LaSalle, Grundy and Kendall counties, warning of a strong thunderstorm that was over northeast over Marseilles at 55 mph. Hail as big as a half of an inch, winds in excess of 40 mph and brief heavy downpours will be possible with the storm system, NWS said. It is likely that this thunderstorm will go through cycles and could strengthen further very quickly, according to NWS. By 4:30 p.m. approximately 6 inches of standing water had flooded the street near 159th and Pulaski in south suburban Markham, according to the NWS. Tuesday brings steady moderate to at times heavy rain with embedded thunderstorms developing late morning and continuing through the afternoon hours. 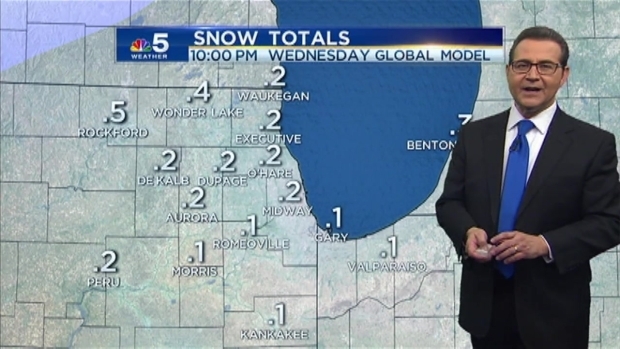 NBC 5's Andy Avalos has more from the forecast. A looming blizzard put 31 million people at risk for severe weather Tuesday, according to the National Weather System, threatening to dump more than a foot of new snow in some areas and snarl traffic across eight states in the Midwest through the course of the day. 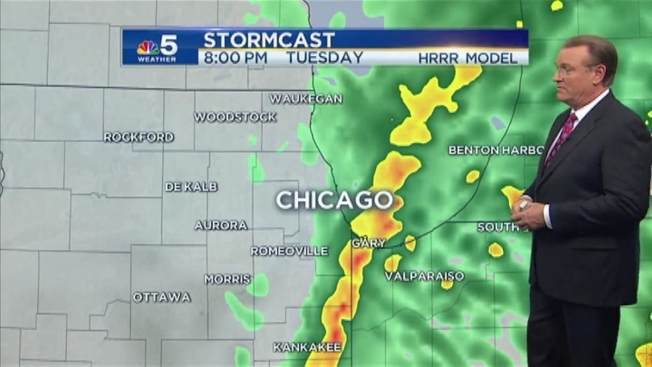 While Chicago won’t get much snow, the effects of the storm will be seen in sometimes heavy downpour and isolated thunderstorms. 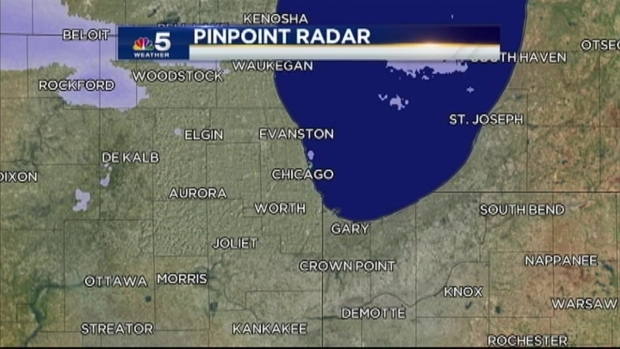 NBC 5's Andy Avalos gives us a look at the weather forecast. The day began with a cold, cloudy and relatively quiet start, changes swept the area hour-by-hour. Some spotty light snow or sleet was reported on some roadways, otherwise the morning was overcast, hazy, damp and chilly. Winds began fairly light but steadily gain strength through the day, becoming extremely windy with gusts reaching upwards of 40 mph. Steady moderate to heavy rain with embedded thunderstorms will likely develop and continue through the afternoon hours. An isolated strong to severe storm will be possible in far southern areas and in Northwest Indiana. And while not likely, an isolated tornado is possible. Evening hours will be mostly cloudy, breezy and chilly with a few lingering spotty showers or drizzle overnight. As the strongest waves of the storm pass, conditions won’t dry up just yet. Wednesday is expected to bring colder temperatures, passing light rain or snow showers on occasion but only minor accumulation possible through the day.